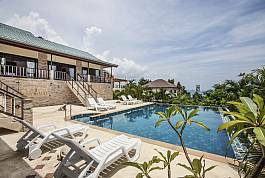 If you are on a hunt for some of the finest quality, luxury Villas available for rent in Koh Samui; then you have most certainly come to the right place indeed. 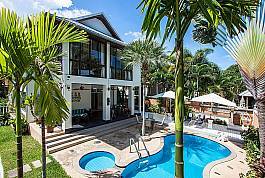 Thailand Holiday Homes is a passionate agency that is dedicated to securing only the highest standard accommodation for its treasured customers. Utilising over ten years of experience, THH can offer comprehensive and honest advice on which areas are best, including all of the pros and cons of the various regions in Thailand. We offer a very human and personalised service that is designed to deliver quality and transparent advice on stunning and luxurious Villas and apartments for rent. We appreciate that if we take care of our customers and give them nothing but the best they will in turn; spread the good word of our services and caring ethos and our business we grow. This attitude toward business is what has helped us develop and maintain a great reputation as being a trusted and noteworthy agency that you can rely on. This luxurious 4-bedroom villa is located just 300 meters from Bangrak at Bophut, and just a 5-minute drive to Chaweng beach, offering a stylish interior, a private swimming pool and gardens, sleeping 8 people. 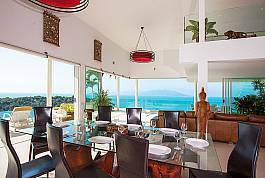 Modern, spacious and awe-inspiring, this is a villa rental basking amidst stunning Tropicana. 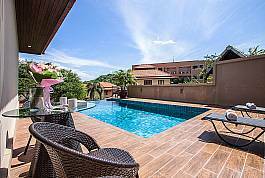 Villa Werona is set on a hill in Bang Por, an area between Nathon and Bophut/Maenam, in an advantageous location close to various attractions. The 4-bedroom villa boasts a private swimming pool and modern amenities enhanced with a Thai style décor and artistic details. Take a trip into the hills outside of Bophut and discover this hidden paradise. This generous 4-bedroom villa offers absolute privacy in the most stunning surroundings. With a spacious living area covering two separate buildings and the added luxury of an infinity private pool with a view, it’s the ideal island getaway. 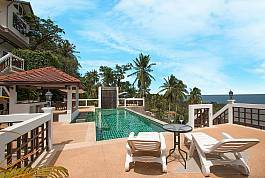 This 4-bedroom Modern Asian style villa is just 100 meters from Thong Song Bay on the north coast of Koh Samui, sleeping 8 and with a private swimming pool. 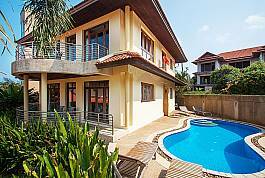 Situated in a secure complex just a short walk from Thongson Beach at Plai Leam, this tropical 4-bedroom villa sleeps 8 people and enjoys stunning views of the outlying mountains. With a private swimming pool and a sensual charm, this villa rental is the ultimate holiday choice. 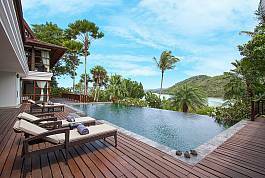 The stunning Summitra Villa offers 4-Bedrooms and is the ultimate Koh Samui holiday. Perched high in the hillside above Choeng Mon Beach, it offers stunning views in all directions, a private infinity pool, and an intriguing combination of modern design combined with Thai antiques and wood carvings. With multiple lounge areas and endless poolside views, the ultimate Samui experience is assured. Located on the Northern coastline of Koh Samui, this 4-bedroom villa is ultra-modern and luxurious, basking in the ultimate sea-view location and coming with all state-of-the-art features. Sleeping 8 people and coming with a private swimming and stunning sea-view terraces, this villa is awe-inspiring in every way. 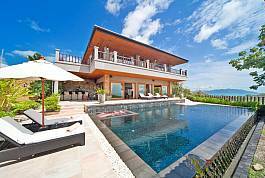 Here is a unique and luxurious villa built with a strong influence from another famous island – Bali. Only 50 meters from the nearest beach and featuring a private pier, the estate is made for selective travelers who appreciate subtlety and refined details. There are 4 bedrooms that sleep up to 8 people. If you have a particular budget that you would like to stick to, or you are looking for something in particular, please do not hesitate to get in touch with us today, and our team will endeavour to find you exactly what you are looking for. We understand that not everyone can afford to pay large amounts on a holiday, though we appreciate that everybody deserves a beautiful holiday to remember in a comfortable and affordable environment. Let us see what we can do to help you today!